The villa is a detached 3 bedroom two bathroom with private pool. There is a roof terrace and downstairs terrace, garden with large marble table and benches with matching barbeque and a pool area to the other side of the villa. A gated drive for car standing. 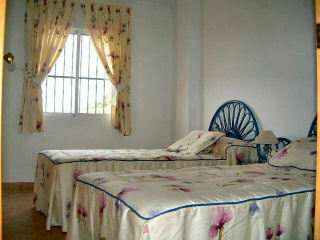 The villa facilities include an alarm system and air conditioning. The lounge/dining room has a table and four chairs, sofa, which can act as another bed and chair, TV, DVD and CD player. The kitchen includes a washing machine, cooker, fridge, freezer and microwave. The bedrooms each have two single beds and well fitted wardrobes with drawers and one of the bedrooms is downstairs and has an additional air bed (ideal for children). There is a double sofa bed in the lounge. Upstairs there is a bathroom with shower overhead, a toilet, washbasin and bidet. There is a 2nd bathroom downstairs with shower, toilet, washbasin and bidet. The villa is situated in the district of Muchamiel only five minutes drive from the traditional Spanish resort of El Campello, with its numerous bars and restaurants, beautiful marina, miles of golden sandy beaches and a train station, taking you to Alicante city one way and as far as Denia in the other. 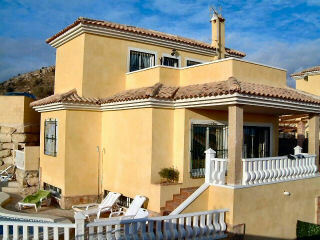 The villa is a 20 minute drive from Alicante city and airport. It is also only 30 minutes from Benidorm and from Tera Mitica theme park and water park. The pool is 8m x 4m. The villa is built on a small mountain and has panoramic views of the coast and the city. It is next to the prestigious Bonalba Golf course, which is an 18 hold 72 par course. A new spa and water park have recently opened at Bonalba with a large pool, water slides, gym, Jacuzzi and treatment rooms.